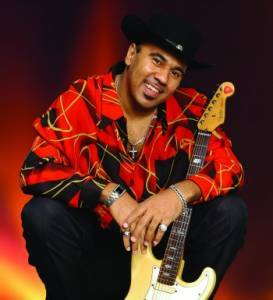 The Blues Series Ronnie Baker Brooks is an American Chicago blues and soul blues guitarist, singer and songwriter. He was a respected club performer in Chicago, before recording three solo albums for Watchdog Records. The son of fellow Chicago blues musician Lonnie Brooks, he is the brother of another blues guitarist, Wayne Baker Brooks. At the age of nine, he first appeared on stage playing guitar alongside his father. In 1985, Brooks graduated from Hales Franciscan High School. He learned to play bass guitar and joined his father's band in 1986. Two years later Alligator Records released Brooks father's live album, Live from Chicago: Bayou Lightning Strikes, which included Ronnie Baker Brooks guitar work. He was then part of Alligator Records 20th Anniversary Tour, and performed alongside Koko Taylor, Elvin Bishop, and Lil' Ed Williams. By 1998 Brooks had gone solo, and his debut album Golddigger, was released the same year on the Watchdog record label. It was produced by Janet Jackson. Brooks was nominated for a Blues Music Award in 2000 for 'Best New Artist'. His second album, Take Me Witcha, followed in May 2001. Brooks most recent album was Torch (2006). The Boston Herald described it as "Ferocious and unrelenting, The Torch may be the year's best blues album" The album included guest contributions from Lonnie Brooks, Eddy Clearwater, Jimmy Johnson, Willie Kent, and Al Kapone, and was produced by Jellybean Johnson. Ticket prices starting at $15. Must be 21 or older to attend. Have a link to a photo instead?